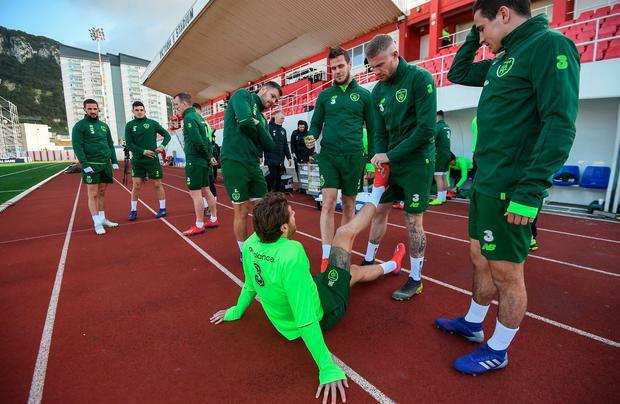 Former Republic of Ireland striker Jonathan Walters is hoping that Mick McCarthy's men don't struggle on the surface for tonight's opening Euro 2020 qualifier in Gibraltar. Very high winds are forecast but it is not just the elements that the visitors will have to contend with. The artificial surface at the Victoria Stadium, where this evening's game takes place, has also caused concerns. Speaking on Virgin Media Sport last night, Walters, who announced his retirement from football, revealed that the artificial surface may lead to some bounces that may be hard for the players to predict. "It's the same on a waterlogged pitch, you'll check the run of the ball and the bounce of the ball. UEFA will have certain protocols and apparently it didn't fare too well. "The modern 4G pitches, I think this is going back a generation. It's a difficult one of the first game but you would hope we would have enough to get the result." McCarthy has played down concerns over the state of the pitch and the blustery weather. "You are aware where we play our football? We don't play in ideal conditions all the time.